« Find the Best Food, Restaurants and Chefs at the Tasting Table! For some time now, we’ve heard about “food deserts,” those areas of Chicago and other cities where there is little to no access to healthy food such as fruit and vegetables. In food deserts, access to food within walking distance of residents homes is often limited to convenience store sand gas stations. this means feeding a family requires a car ride or public transportation ride to a grocery store outside the neighborhood or a dinner of potato chips pop and candy. Public health officials and groups like Building a Healthier Chicago, are working on improving the options for “food desert” areas by helping plant community gardens, creating farmers markets and providing nutritional education. Now the home delivery grocery service, Peapod, provides a 2010 alternative for families needing healthy food in food deserts–Peapod brings the food to the neighborhood! Read more about PeaPod new offerings in Chicago areas considered food deserts here. But food deserts are not only found in low-income neighborhoods. You may have a food desert in your own home! How can this be? Well, if the majority if your food is frozen, sodium-laced dinners like TV dinners, if your shelves are stocked with many packaged products with high fructose corn sweeteners, high sodium, partially hydrogenated oils (aka trans fats) and if your refrigerator is full of corn sweetened soda pop and juices, you may be under nourishing yourself and your family. When I was growing up, my mom was so proud that she could afford to feed her family the latest new convenience foods. As a mom and a nurse, she tried to give us what she thought was healthy food. In my childhood (lo so many years ago, but long after fire was invented), TV dinners were a hot new thang. Tang tasted odd, but the astronauts drank it, so it must be good. Canned vegetables meant we could eat veggies year round. (Versus in my mom’s day when she could only get veggies and fruit in season.) Hamburger Helper did help my working mom. Shake and Bake Chicken, Rice a Roni, all these were staples in our kitchen. My mother and other working parents did the best they can to feed their children what they believed was healthy food. At the time all theses products came out, my mother thought she as feeding us the very best there was to offer her family. Years later, after childhood and adult obesity has become a national health crisis, we learn that all that new and exciting packaged, astronaut-endorsed food was not so healthy for us. Yet old habits are hard to break. And high fat, high sodium, high sugary foods taste great and are addicting. If the majority of food in your home is heavily processed and you have few or no fresh fruit or vegetables, you are living in your own food desert. Don’t despair though, help is one the way! What can you do to change your home from a food desert to a food oasis? • Reduce your purchase and family consumption of processed foods. 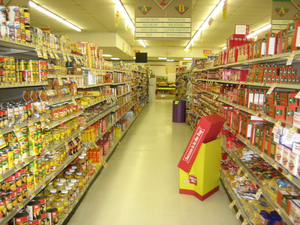 Processed foods are usually found in the center aisle of the grocery store. When you read the label, even if the box says “NO trans Fats”, if you see “partially hydrogenated oil” or any kind of fat that is hydrogenated at all, that food has trans fats in it. The FDA allows manufacturers to label a food Trans fat-free if a single servicing size has less than .5 grams of trans fats in it. So, if a servicing size is half a cookie, then the whole cookie could have 1 gram of trans fat. The labeling and serving size restriction is easy to circumvent by food manufacturers. Savvy shoppers know to read the label and look for the words “partially hydrogenated” versus the big “Trans Fat Free” label, which often is meaningless as you can see by my illustration. • Increase your purchase and consumption of fresh fruit and vegetables. This is difficult for many people because they lack the skills to cook and prepare fresh veggies. Fruit is easier to serve and prepare. Most fruit can be eaten by itself. Apples, pears, peaches, bananas, even watermelon needs little to no preparation beyond washing to outer skin. But small children (and even many adults) used to sugary foods, may have a hard time switching to the real thing: Fresh fruit. Try fruit bowls with multiple types of fruit. Get in the habit of feeding your children or yourself at least a piece of fruit a day or twice a day. pack a banana for lunch or apple or pair. Fill a ziplock baggie with a serving of dried fruit like raisins and almonds or pecans. An easy and super healthy way to prepare vegetables is by steaming them. Use a small stainless steel veggie steamer (which you can get a Target or Kmart or Bed Bath and Beyond for about $5.00) to cook your veggies without leaching out a lot of the valuable nutrients. brocoli, asparagus, zucchini, even spinich quick quickly in a vegetable steamer. If you or your family can’t stomach veggies alone, put a small, very very small amount of butter (a sliver not a pat of butter) or olive oil on the veggies to season them. (Over time reduce the amount of butter or oil you use as you become more accustomed to the taste of fresh steamed veggies). • Eliminate soda pop from your diet and your family’s diet. I know this is a tough one for many people. But soda pop is simply sugary water. Highly sugary water at that. “Diet” sodas are not much better for you. The number one drink for hydration, health and great skin is, water. Not juice, not beer, not tonic water. Just plain water. If you or your family have a hard time drinking plain old water, try adding a squeeze of lemon juice or lime juice for flavor. If you must have some sweetener, stir in a bit of real sugar, not corn syrup-sweetened soda! • Try serving a meatless meal from time to time (especially, if your dinner menu tends to be meat and potatoes). Meatless does NOT have to be tasteless. A dinner of rice and beans is high in protean and can be favored with a variety of spices to increase the taste. Falafel, a Middle Eastern staple, is a fried pattie made of spices and garbanzo beans. That may not SOUND appetizing, but try it out before you pass it up! • Try baking snacks from scratch. Do it yourself, “Lara bars” are easy to make and super healthy. If you must have cookies or cakes, make them yourself at home instead of from a box or bought from a store. Sorry Sara Lee and Entenmann’s but there is no substitute for homemade. And by making goodies at home you teach your kids to cook, can control the ingredients, and can spend some quality time with your family. If you don’t have time to cook during the week, make it a regular family weekend event! Share your food desert transformation stories with us in the comment section!